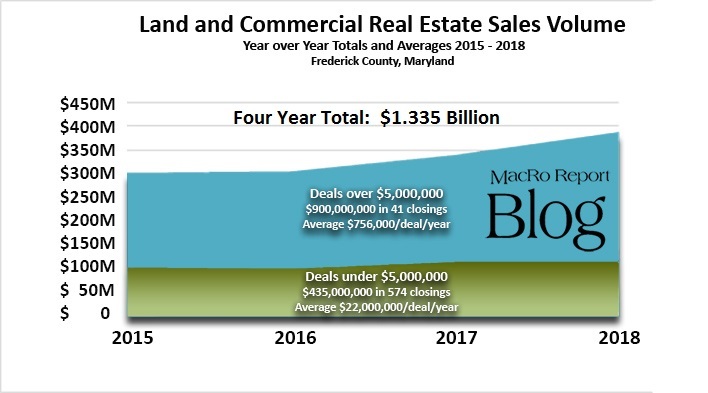 It was back in 2012 that local land and commercial real estate industry trend watchers were hoping that from the bowels of Frederick’s recessionary woes, gross sales across the county could reach the magic total of $200,000,000. Well, as the year closed out, low and behold, the total volume beat that mark by $40,000. It happened in 143 closed transactions that year. Seven years later, at the dawn of 2019, total CRE sales volume in the county closed out last year by practically doubling that prior seemingly impossible goal at $388 million with 175 closings. That follows the steady increases of $276 mil in 141 deals in 2015, $331 mil in 133 deals in 2016 and $340 mil in 165 deals in 2017. The simple answer is that all aspects of the US and local economy has steadily grown with business expansion and job growth leading the way. Liquidity that once sat on the sidelines began to carefully flow back into the commercial real estate market, and lately, investors from outside the borders of our county (and nation) are especially finding CRE a safer bet for solid returns than in their home countries. Those growing businesses and investor pools did not overlook Frederick County by any means. All one has to do is look at the incredible surge in size of the average transactions in excess of $5 million since the year 2015 came to a close. Gross volume of those transactions reported four years ago hit $197 million. With 15 deals over $5 million, the average ticket punched in at $13,000,000. At the close of 2018, the volume of big deals exceeded $273 million in just ten deals, churning out an average price of $27,300,000. That’s an increase of 108% in volume over that four-year period … and a drop of 33% in the numbers of transactions! The transfers within Frederick’s multifamily sector have been the most significant contributor to that 33% boost in the sales over $5 million. In 2015, that sector closed 11 deals at a value of over $60 million between ’16 and ’17, and another $219 million in apartment sales happened in 12 transfers. And in 2018 alone, 14 deals yielded $174 million in closings. That’s a total of over $453 million in 37 transactions. To put that in perspective, compare that to the fact that the combined sales volume of all CRE sales under $5 million from 2015 through 2018 only reached $435 million in 574 closings! To put it another way, the dollar volume of property transfers in the multifamily sector made up 34% of the $1.3 billion in combined total of ALL land and commercial real estate sales, during that period! Now the secret is out, and that’s a BIG chunk of the market! The trend in the number of closed deals per year that transacted under $5,000,000 has grown steadily over the last 4 years. Consider that the average sale of CRE properties in 2015 equaled $813,000 from 128 closings. The in-between years of ’16 and ’17 averaged 140 closings at a sales price of $766,000 per annum. In 2018, the number of closed deals under $5 mil hit 165 at an average price of $693,000. As a matter of reference, the impact of big deals since 2015 really hits home when one looks at the minuscule increase in total volume of properties sold under $5 mil – total sales volume was $104 million in 2015, but only trended to a total of $114 million last year … that’s a mere annual increase of only 2.5%. The land and commercial real estate market is very much alive in Frederick County, Maryland. Properties are changing hands at increasing number of deals under $5 million, but to date on average, has only yielded modest price increases. The major influence in the record breaking overall annual sales volume in CRE has been heavily influenced by a surge in new business growth, business expansion within the county and those that relocate to this very attractive suburb of the DC/Baltimore metro area. In addition, as investors from all over the world seek quality income related properties throughout the nation, Frederick is seen as an attractive and stable investment … especially for multifamily product! Do you have questions about the land and commercial market in Frederick and the mid-Maryland area? Feel free to call any member of our team for sales, leasing, consulting and property management services … we’ll be happy to help!